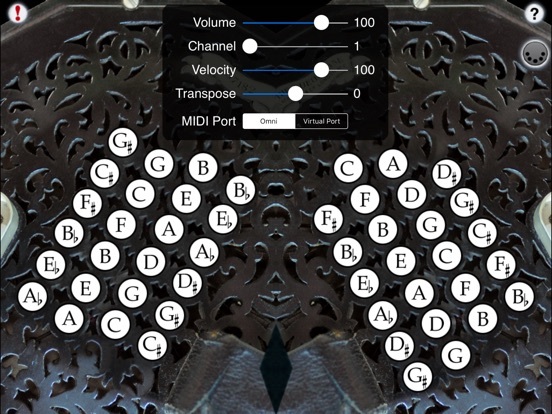 MIDITinaXL is 48-button English Concertina CoreMIDI control surface for the iPad. 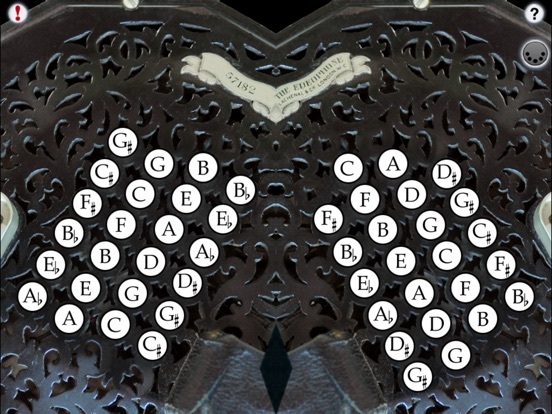 The button layout is identical to the real instrument, and the built-in note guide makes it easy to learn to play! MIDITinaXL doesn't produce any sound on its own, it is for playing hardware or software VST-style MIDI synthesizers via CoreMIDI hardware interfaces connected to the dock connector or virtual MIDI instruments running on your device such as my "Celtic Sounds" MIDI sound module app. Use the "MIDI Port" switch to choose between "Omni" sending MIDI data to all CoreMIDI apps or "Virtual Port" sending to a named CoreMIDI virtual output port. When the "Virtual Port option is selected, MIDITinaXL will show up as an input option in apps that support virtual ports like Sonosaurus ThumbJam. "Omni" mode is selected by default. All MIDI settings are saved when MIDITinaXL quits and restored the next time it is run.